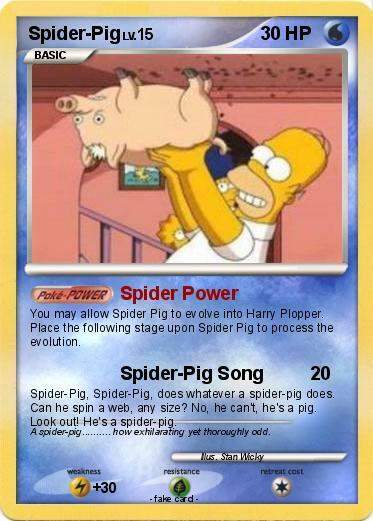 You may allow Spider Pig to evolve into Harry Plopper. Place the following stage upon Spider Pig to process the evolution. Spider-Pig, Spider-Pig, does whatever a spider-pig does. Can he spin a web, any size? No, he can't, he's a pig. Look out! He's a spider-pig. Comments : A spider-pig.......... how exhilarating yet thoroughly odd.